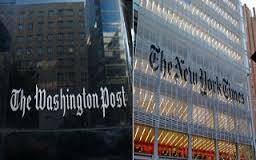 The New York Times and The Washington Post have swapped staffers. The Times has added WaPo’s Adam Goldman, and the Times’ Kareem Fahim is joining WaPo. Goldman joins the Times as a reporter covering the FBI and counter-terrorism. He previously worked as a national security reporter for the Post. Fahim, most recently the Times’ Middle East correspondent, is joining WaPo as its Istanbul bureau chief.